EMI has assembled quite the variety of back-catalogue performances for the Hindemith installment of its "Twentieth Century Classics" series. The question will be how much you want (or need) any of these particular performances. The prize here is Ormandy's Concert Music for Strings and Brass, which may surprise you - you'd probably not think of this as an Ormandy piece, offhand. Amid all the fuss over the famed Philadelphia string sound, it was easy to forget that the orchestra's brasses were capable of crisp, bold playing, and here they project solo and ensemble lines alike with a trenchant brilliance. In the second movement, Ormandy has his string players stress the burr of the bow attack rather than their customary lush depth, maintaining an overall astringency through the long, arching phrases; his straightforward, no-nonsense pacing of both movements assures musical continuity. The recording is clean and vivid. Equally fine is Sawallisch's account of Nobilissima Visione, a ballet showing a kinder, gentler Hindemith. The strings dominate the sonority, perhaps more than necessary; Martinon (RCA), allowing his Chicago Symphony winds greater prominence, drew more varied colors from the score. But Sawallisch had, by 1995, gone some way towards restoring the "Philadelphia sound" so carefully dismantled by Muti, sometimes eliciting a layered, organlike fullness in tutti, and you can't really blame him for favoring his expressive, buoyant strings. And the conductor doesn't shortchange the winds where they're clearly central, as with the crisp, clear flute over strings at the Rondo's start, or the searching purity of the sort-of-chorale at 2:33 of the Passacaglia. Oddly, the Symphonic Metamorphoses -- the ballet's original LP coupling -- isn't nearly as good. Part of the problem is a different recording venue, which produces boomy bass, though the brass instruments register with depth. But Sawallisch's heavily stressed manner in the opening Allegro sounds flatfooted and not at all shapely. Those passages featuring the liquid woodwinds come off better than that - I liked their ambivalent take on their Janáčekish theme in the Scherzo - but only the concluding March consistently maintains some uplift. Viola jokes aside, performers of Der Schwanendreher face the usual problem of projecting a clear identity for the solo instrument, rather than letting it sound like a sort of violin with an added C string. Tabea Zimmermann's tone isn't particularly rich, but there's enough alto in it to cut a distinctive musical profile, and the playing is smooth and vibrant. David Shallon elicits soft-edged attacks from the Bavarian Radio forces, but this isn't necessarily bad, highlighting the score's lyrical, rather than its "difficult," aspects. The more lightly scored passages are deeply felt, and the Variationen finale has a nice swagger in tutti, which the soloist maintains less insistently, offering a nice contrast. What interest inheres in the two older recordings is more historical than musical. The Symphonia serena hasn't been recorded much, and the composer's presence at the podium gives this version an imprimatur of sorts. 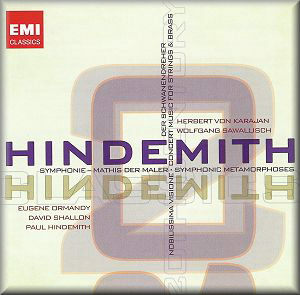 Here, the quieter passages are deliciously clear -- the chattering Philharmonia woodwinds have a pillowy delicacy in the Geschwindmarsch -- and Hindemith is alert to contrasts of texture, both within and between movements. But as the sonorities fill out, the playing isn't quite precise, and there's a sense of aimless drifting; the climactic tuttis are unappealing. One expects Karajan's Mathis der Maler to be something special, and occasionally it is, at its most convincing when suffused by the vibrant glow of sustained strings. The searching, luminous opening is tremendously atmospheric, with the textures filling out expansively; the closing chords of the Grabiegung movement have a lovely aura. Karajan's handling of the full-throated brass choir, more forward and clean than it would become later, is also impressive. But the conductor isn't always so careful over detail. In the fugal bit, originally launched by the flute, at 4:09 of the Engelskonzert, the playing is slurry and imprecisely coordinated. The third movement's driving dotted rhythms are inconsistent: the trumpets are good and crisp, the horns recessive, the strings mushy and lacking in point. Digital tweaking has brightened up the sound, at least. This is a good mid-price acquisition for the Concert Music and Nobilissima. But Mathis der Maler, after all, is essential, and here it doesn't show at its best. William Steinberg's translucent Mathis used to be available on a DG Galleria issue, along with his excellent Concert Music and the fine Binyamini/Barenboim Schwanendreher. If you add the young Abbado's Symphonic Metamorphoses (Decca) and Martinon's Nobilissima (RCA), you'll have assembled a more impressive "basic" Hindemith, though you'll have spent rather more for it.